While it may look like Agile teams all work in big empty â€œcommon rooms”, the truth is that people need more than that. Elements like light, air, traffic flow, noise, refreshments and comfort are not negligible: high productivity teams still consist of people, not robots, and these hard working people can be enabled or discouraged by the spaces in which they work. You love your work. You love your family. It’s a difficult balancing act: which is winning at your house, these days? Does Agile Software Development do away with Business Analysts? I’ve been exploring career directions – and I must admit, this question has haunted me for a while. Fearing the answer to be “yes”, I forged ahead, wading through blogs, and meeting with colleagues to find out how they work. My conclusion: Agile Software Development transforms the role of the Business Analyst. 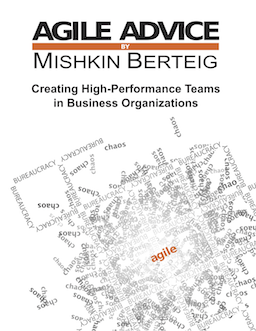 But this is not surprising – one of the main things that happens when working Agile is a realignment of responsibility with accountability. Customers become responsible to state and prioritize their requirements – and Agile processes hold them accountable for these things. Development teams become wholly responsible for delivering the required functionality – and are held accountable for its quality. The Business Analyst may find herself floating between these two responsibilities. She must navigate this territory with care – our old way of working often meant taking on accountability from these two groups, a step backward when working Agile. I believe that the BA can become a facilitator – enabling Customers and or Developers to get their jobs done. In some organizations, this role is called “Agile Coach”, and may be played by a BA, a Developer or anyone passionate about enabling the work of the team. While not every team needs a coach, it can be an important role – particularly when newly adopting Agile. There is a balancing act required to do this… my blog covers a few scenarios derived from discussions with my Toronto colleagues. A BA not interested in coaching could also retrain as a Developer or move into the Customer camp as a Product Owner or Product Manager. Fear not, there are still many ways to help build great software! I love Hal Macomber’s blog “Reforming Project Management”. And while he writes from a background of Lean Construction, his posts apply across other domains as well – I find they often resonate with the work I do in Agile software development. His site also includes articles and web conferences, and has an RSS feed so you don’t miss his short, salient posts. Have a look!